Pavers are versatile building materials and are widely used in landscaping- both residential and commercial. AAA Pavers Inc has extensive experience in creating the most exquisite patios with different types of pavers. 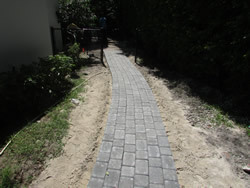 We have hundreds of satisfied customers in the Greater Palm Beach areas and have been providing consistent and high-quality paving services for a number of years. Walkway pavers are available in a range of shapes, designs, styles, textures and colors and we also create the most stunning patterns on your walkway. Typically, pavers are placed on a base of compacted gravel & sand and since they are individual pieces, there is no worry about cracking and chipping (like in the case of stamped concrete). We can use concrete, natural stone or brick pavers as the design demands and as per your specific needs. Though stone is a very strong and durable material, since it is a natural product, it is available in a limited number of textures and colors. 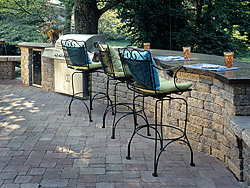 Concrete and brick pavers on the other hand are made of man-made materials and are available in a range of colors. But natural stone has a very earthy and rustic feel that is hard to beat and we can create the most stunning walkway & patios with the kind of pavers you prefer. The kind of material you use will generally be based on the materials that have been used in the rest of the landscape. For instance, if your patio has a brick fireplace, you might want to use brick pavers. But there are times when the contrasting effect of stone pavers and a brick fireplace offset each other in a very dramatic manner. With our years of experience in installing patios, we have a very deep understanding about what effects different materials have when they are used in combination with each other, to create the right impact. 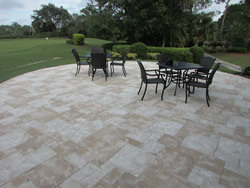 As you can see, there are a number of reasons for choosing pavers for your walkway and patios. 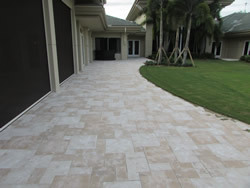 If you need specialized and high-quality paving in the North Palm Beach, Lake Park and Riviera Beach areas, contact AAA Pavers Inc, via our website form and we will call you. 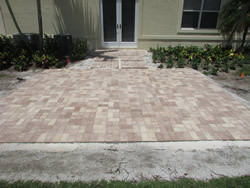 The best pavers, exemplary service and affordable paving options are what we will provide you with. When it's time to take life outdoors to the Patio or courtyard, Pavers play the perfect host-whether it's upscale Alfresco dinner parties or everyday wear -and - tear from the kids. And though the youngsters won't notice the intriguing patterns or Old World charm, you can bet your guests certainly will. While Pavers are often compared to stamped concrete, the only real similarity is the cost. Pavers are not only more beautiful, but are more durable and crack resistant, available in a wide range of colors and shapes to make sure your imagination has plenty of room to play. 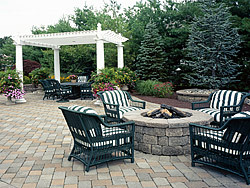 Pavers are the preferred choice for Patio hardscaping.